I am so excited about my Giveaway Times Two...keep reading to learn more!! 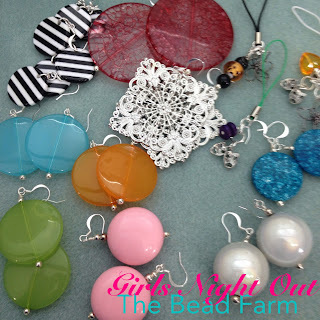 So you've all seen me blog about one of my favorite "Girls Night Out" destination places, The Bead Farm at Gardner Village. It's the perfect place to hang out. You can do a little shopping, bead for a couple (few) hours and then go to dinner at Archibalds. My only complaint is I wish they stayed open later...although they do throw some amazingly fun midnight madness night outs ocassionally. Well my last trip to The Bead Farm I was hooked on making Earrings. I love that I can use their tools, they only charge me for my supplies I use and I get to pick beads from an entire store of yummy beads. Oh and let's not forget I have Callie and Colleen available to help me create whatever I challenge them with...it's the prefect night for me and my friends!! But I have something super fun. Callie asked me to pick a necklace and earring set that she created and sells at the store (yes you do not have to make your own things, they have a wonderful selection hand-made jewelry). She loves that I love her store and has had quite a few of my readers come in to visit her because of reading about the shop on my blog. So she wanted me to pick a set out to GIVEAWAY. And trust me this is a hard one...I so want to keep this one. Here is it, I'm told the beads are called "Miracle Beads"...they look like a bead inside of a bead...they're stunning!! 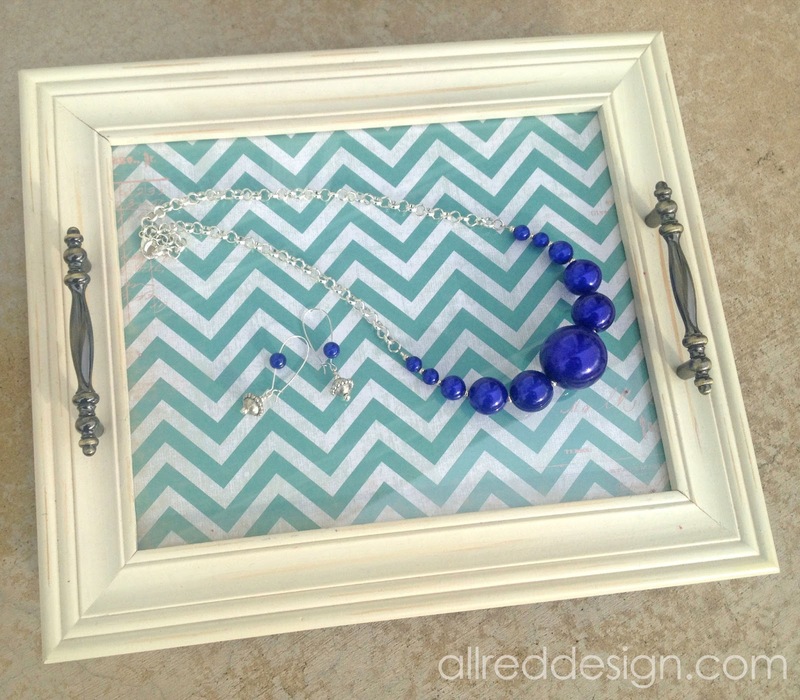 The lucky winner will receive both the necklace and earrings...thanks Callie and The Bead Farm!! I thought it only fitting to MODEL the necklace at a recent photo shoot so you can see how amazing it looks on....I figured this was as close as I'd get to owning it (wink)! 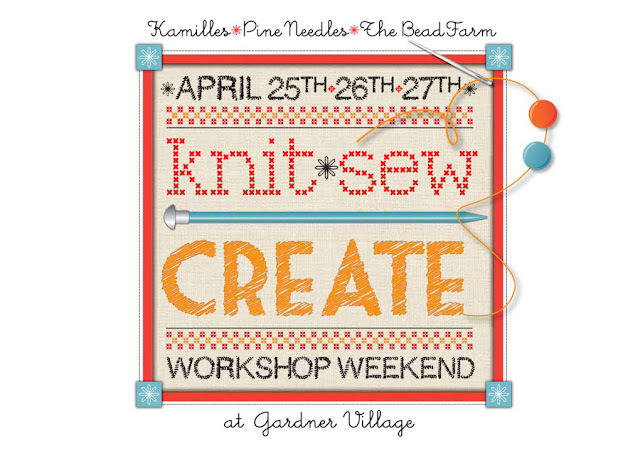 But it gets even better too.... have you heard that Gardner Village is hosting the Knit-Sew-Create Workshop Weekend on April 25th, 26th and 27th? This is an amazing opportunity to create what you love or learn something new! If I weren't going to be out of the country I would totally take the mini workshops on crocheting and knitting and there's an adorable fabric bloom sewing class (super cute). But then of course I would sign up for every class being taught at The Bead Farm. 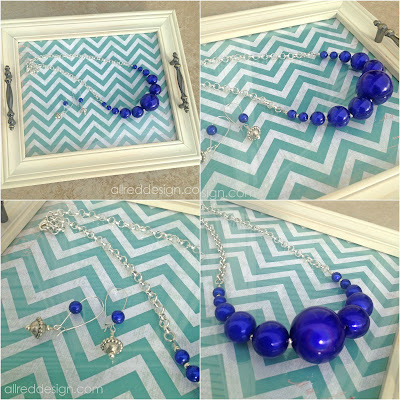 Be sure to check out the Swarovski Chevron Bracelet that Callie's husband designed and is teaching. It's STUNNING in person. All for only $266 per person. Don't worry if the price is too high or you don't have time to take that many classes. They do over an Express Pass for only $99. Learn more about it here. But wouldn't you LOVE to win a Workshop Weekend pass for FREE?? Scroll down and enter using the widget below. We're giving away two amazing prizes. 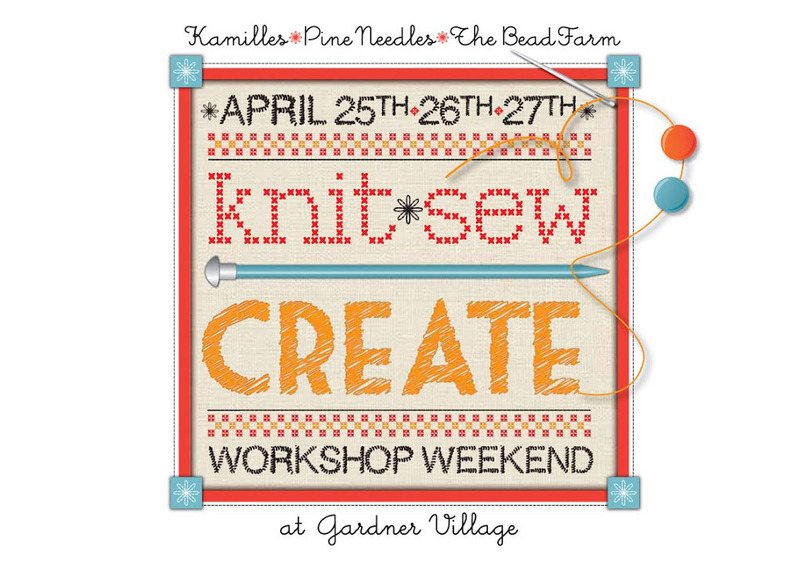 The first is an one Knit Sew Create Workshop Weekend Pass ($266 value). The second prize is the beautiful Blue Miracle Bead Necklace and Earring Set ($35 value). To enter to win the Workshop Weekend pass use the Widget Below to enter. To enter to win the necklace/earring set simply leave a comment here on my blog. I'd love to know where you're visiting from too! Giveaway closes Sunday, April 14th at 11:59pm MST. Winner will be announced on my blog by Tuesday 4/16. So wish I lived close by so I could attend the weekend and learn how to knit. I've always wanted to learn, just never took the time to learn how. The weekend looks so fun. I've never heard of these miracle beads but I LOVE beads. 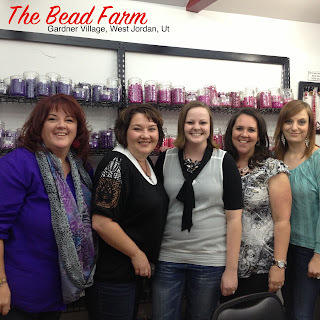 I'm visiting your site from a link posted by The Bead Farm on Facebook. I tried to comment from my phone. It doesn't look like it worked but if it did and this is a duplicate post, I apologize. looks like a fun weekend. I am not available to attend it. I am in NC and we finally have gorgeous weather here. it's been a blustery spring but the sun is ready to come out and play. yea! the beads are awesome. I would love to win a set of my favorite color beads! we joke that everything in our world is blue. blue house, blue carpet, blue tile blue door pulls blue clothes just blue is my world. i'm not blue color me happy! 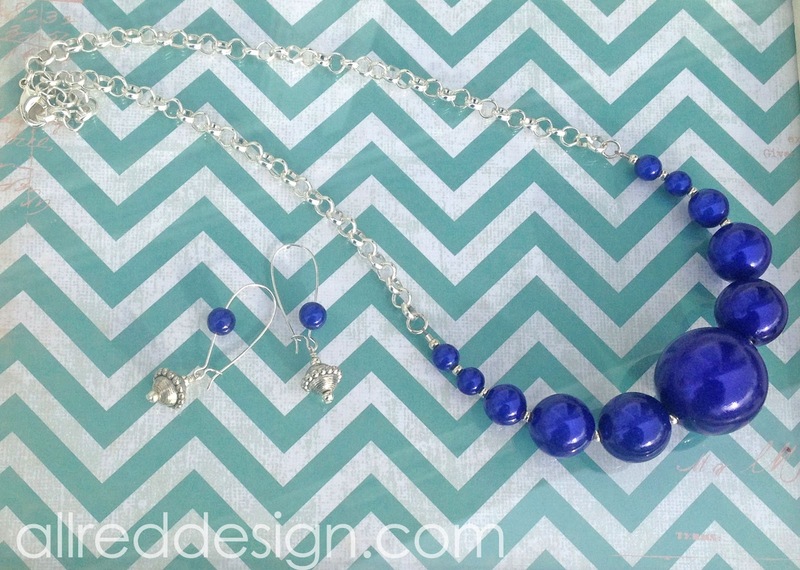 I would love to win the Blue Miracle Bead Necklace and Earring Set, it is beautiful. That would be such a fun thing! I need a girls day out! I would love a crochet and knit class. I would Love to win the pretty jewelry! I would love to attend the weekend, but it's a bit of a trip from Maryland. Love, love the necklace and earring set. Thanks for the giveaway! Love love love the jewelry and would so love to start making jewelry. I live in NC so unfortunately the classes are not convenient. Love the necklace and earring set. Thanks for the giveaway. Would love to have that week-end but I'm in South Alabama!! But I would love to have that beautiful necklace set as a conciliation prize :) Thank you for the chance to win. I am another NC girl without air miles. Thanks for the super giveaway. Now that would be fun. I stopped by your bead store last time I was in Gardner village and was so impressed! Can't wait to return. I love The Bead Farm and their classes. Hi Lori! I would love to win the super cute necklace/earrings!! Pretty color! Lori - I love the necklace & earrings. I have the perfect dress that they would match. I love all your energy and great taste too!! I won't be able to attend the workshop, but I would love to be entered into the necklace and earring set.